I’m also shy, I have anxiety about being with people. (You can learn more about thedifferences of introversion and shyness here.) This can be especially true when I don’t know them very well. So, here is the thing that makes people both completely interesting to me but at the same time terrifying. I’m someone that likes familiarity. While I may enjoy doing new things, even finding those new things to be fun and exciting. New is both stimulating and also anxiety producing. There is a fear of the unknown for me. When it comes to people, because no two people are exactly alike I often feel that sense of unknown. I can guess and surmise at what the other person might do but that doesn’t necessarily mean they will do it. Even with educated guesses there is still a sense of unpredictability. I need the comfort of something familiar. A while ago I took an online parenting class from Quietrev.com (I'm not an affiliate). In it the concept of having a bridge friend for introvert children to feel more comfortable in a new situation. Looking back I can see how much the bridge friends in my life helped me. I have also seen how having a bridge friend in the form of her little sister has helped my 4 year old, Lil Bug become more comfortable a lot quicker than in the past. That familiar and nonjudgmental friend helps the child (or adult) to be more comfortable accepting the new stimuli and more confident in sharing who they are with others. On top of the sense of unfamiliarity, Introverts often crave deeper connections and deeper meaning. Which in my case, means that when I meet people who are new or who I don’t know as well it is tedious and awkward for me to converse through small talk, which inevitably is the start of a conversation. I crave the ability to connect and discuss things that are more meaningful to me. What’s ironic about this is that at the same time that I’m desiring that connection, I’m also anxious about making that connection. Because then I am vulnerable. I am showing a new part of me. I wonder will they accept me as I am or will they find chance to criticize me. I do want to take a moment and say that though I worry about others finding fault with me in their own eyes, that does not mean that I am less sure of myself. I still love who I am. It’s more a matter of showing them a part of me that I care about and love and the other person not seeing me for what I am. I worry that people will focus more on the negatives (more like perceived) negatives of our differences rather than the positives of those differences. But, here is the amazing thing about making a connection with someone who is different from you. I love stories. I have always enjoyed reading, I love how books can take me to another world, another life, another experience. I love how I can learn from the stories I hear and read. I love how they can inspire. And I also love how I can better understand someone when I hear the story of their life. There is a connection that can be made when someone tells you their story, whether you’ve experienced something similar or not. 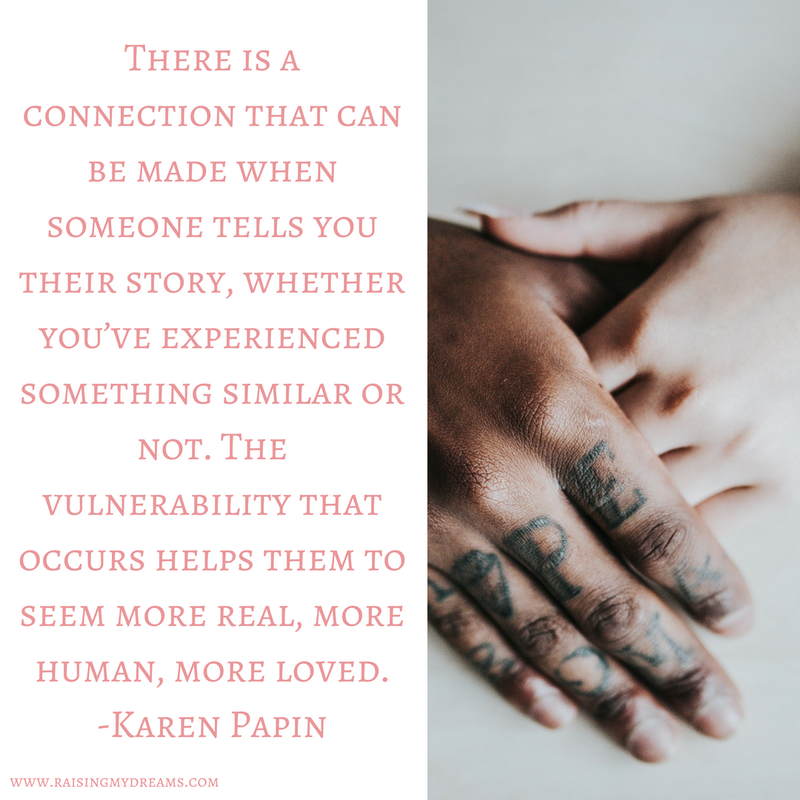 The vulnerability that occurs helps them to seem more real, more human, more loved. We can learn from these stories that others tell about themselves. Yes, that vulnerability can be scary, but it can be something extraordinary as well. 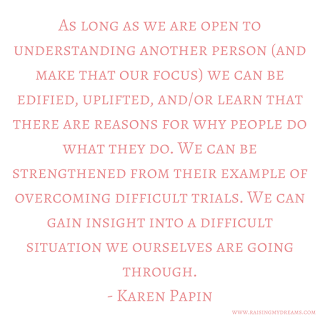 As long as we are open to understanding another person (and make that our focus) we can be edified, uplifted, and/or learn that there are reasons for why people do what they do. We can be strengthened from their example of overcoming difficult trials. 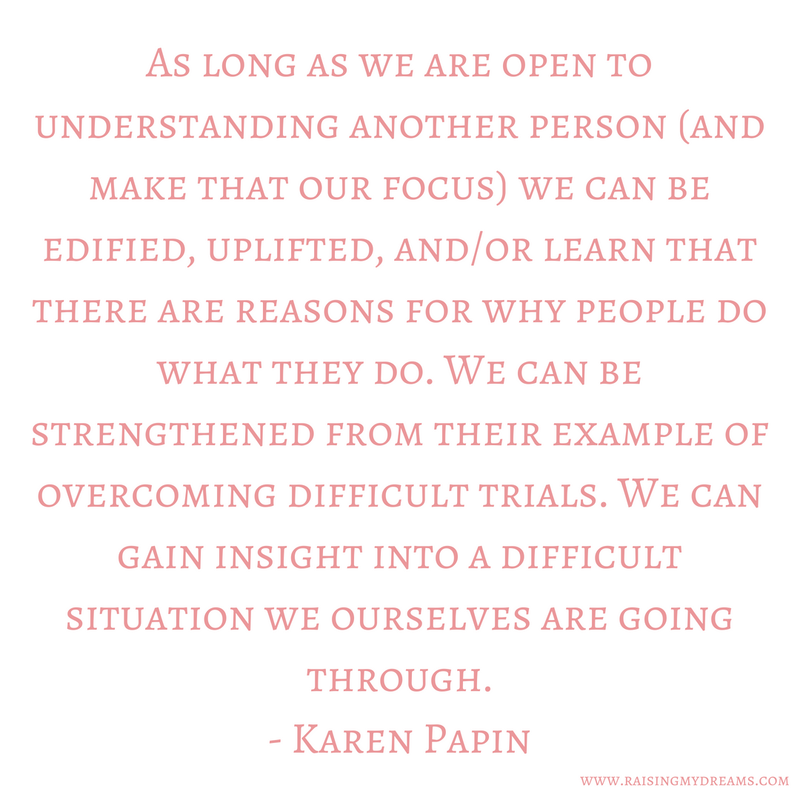 We can gain insight into a difficult situation we ourselves are going through. Unfortunately, differences can cause contention too. People come with extreme feelings about what they believe and think about the world. But, if we would take the thoughts and ideas that we feel passionate about and share them with others, listening in return, in a nonjudgmental way and in a nonjudgmental setting, we can learn from each other. That isn’t too say that any major changes would occur to our thoughts or beliefs or that someone else will change their own beliefs. That’s not what understanding someone means. Understanding is gaining a greater insight into why someone else may have a different belief than us. Likewise creating a meaningful connection is not about going into a conversation expecting to change the other person’s viewpoint. 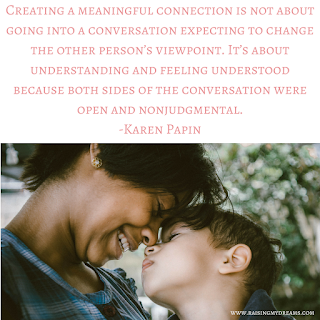 It’s about understanding and feeling understood because both sides of the conversation were open and nonjudgmental. When I was in graduate school for counseling psychology, I remember an amazing young woman in my class. The teacher was talking about how there will be times that we, as psycho therapists will be limited in our ability to counsel someone because of certain biases we may have. The teacher gave an example of someone who had done something quite troubling to many. But, I’ll never forget the response of this particular young woman in my class. Upon hearing what this troubled person did, she said, “Wow, he must really be hurting.” Her concern for this man who had done something many couldn’t even fathom pierced my soul. I gained a great respect for this young woman and loved her for her concern. But, what is even more amazing was I also gained compassion for the person that our teacher had told us about. It was a reminder that there are reasons to why people do things. We may not agree with everyone, but we can gain greater insight into why they do what they do and we can still love them. I am someone who has a firm belief in my religion, but I still find it fascinating to learn about other religions. I love looking for commonalities within the religions and also seeing how they differ. Both the things that are common and the differences are captivating to me. In college I took a world religions class and loved it. I now own a copy of the Dhammapada and I believe that the Bhagavad Gita is absolutely beautiful, though I myself am a Christian. There is truth in many places. I have also found that through studying both what I believe and the beliefs of others, I have gained a greater understanding not only of those who believe differently from me but I have also gained a greater understanding of my own faith. The examples of people like Pema Chodron, Ghandi, Mother Theresa, and Buddha have helped me to have a greater desire to live my own religion. My study has actually deepened my own belief in my own religion as I have come to see such parallels. This is the case in relation to politics as well. I’m in a family where political beliefs differ among my family members quite a bit, from one extreme to the other. Yet, I am thankful for a husband who seeks articles and information about both sides of the issues. If you are familiar with Gretchen Rubin’s Four Tendencies, he is a questioner by nature. He has encouraged me to be better informed on political subjects. My hope is that we can all have a more inquisitive nature and with that inquisitiveness, a more kind and compassionate view towards others as we hear their stories. We can learn so much from each other. 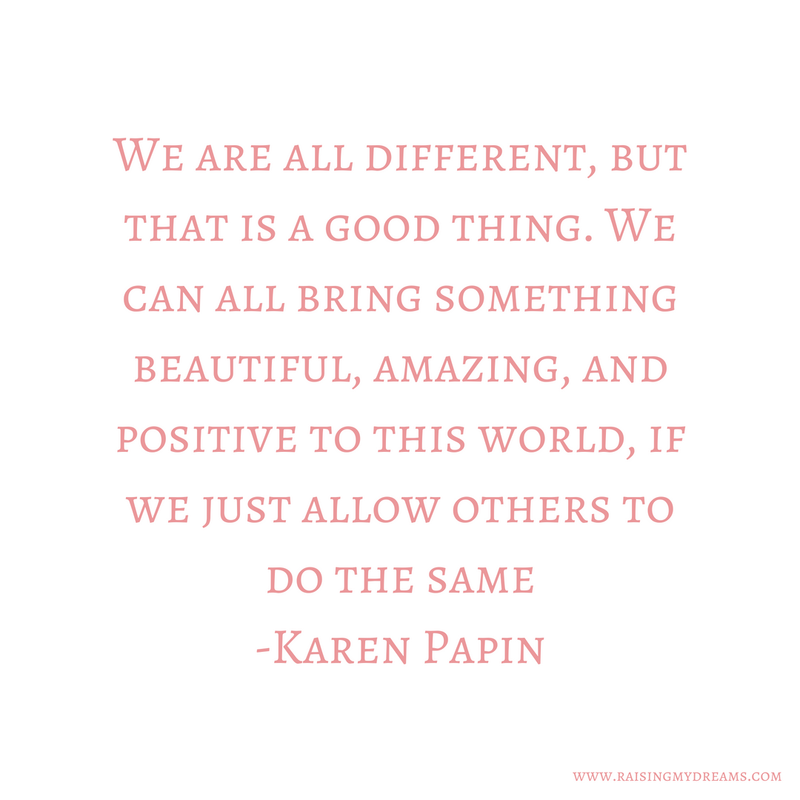 We are all different, but that is a good thing. 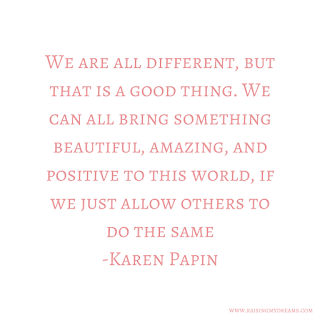 We can all bring something beautiful, amazing, and positive to this world, if we just allow others to do the same. Let’s fill the world with kindness, compassion and love. Let’s help others to feel understood. And let’s remember that every person has a story. I am a highly sensitive introvert, raised to embrace that and not see it as a bad thing. Now I am a mother, seeking to raise my little dreams in a way that helps them see that their quirks are not weaknesses but strengths. With a Bachelor's degree in psychology and my love of learning I apply the things I've learned to helping my children, self, and others thrive. Raising My Dreams makes no guarantee as to the procedures and information contained here. The publisher will not be liable for direct, indirect, incidental or consequential damages in connection with or arising from the use of the information displayed on this website. Raising My Dreams is not intended to substitute for the advice of a professional. Please do not reproduce, repost, make sellable items or redistribute without written permission.